Town with 8.800 inhabitants. South-eastward from Budapest (road M5). 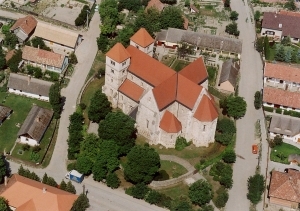 Reformed church in Romanesque style built in 1234 as Premonstratensian provost church. In the reformed cemetery wooden headboards on tombs, art works of local wood carvers. Nature conservation area with boggy meadows and woods, and with wine cellars of the village. Since 1982 a bird-ringing and research centre has been working in Ócsa. The regional museum presents the sights of the territory apart from the collection of ethnography. The one-week Cultural Days of Ócsa are held at the end of May.